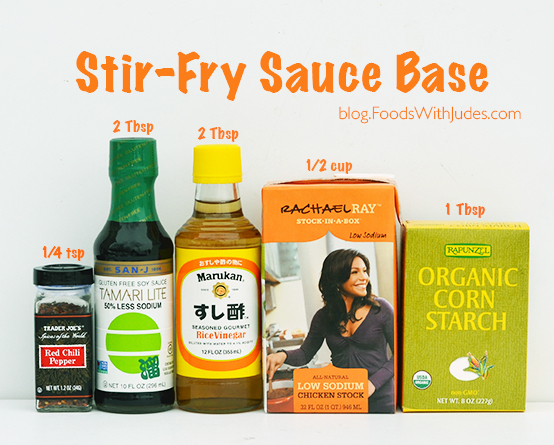 Stir-fry is a tasty way to eat more vegetables, but I am often asked how to make the stir-fry sauce. The trick is knowing a few key sauce ingredients, and then learning how to tweak the basic recipe to make your favorite type of stir-fry sauce like sesame, sweet & sour, or my favorite, lemon. Then you have the flexibility to combine your sauce with a variety of vegetables and protein choices. You make it easily, because I’ve broken it down into a few simple formulas. Adding the 1/4 tsp of red pepper flakes in the sauce base makes the finished stir-fry only slightly spicy when combined with all of the ingredients and eaten with rice. So, if you don’t like spicy food, stick with this amount. If you do like spice, feel free to add more crushed red pepper or even fresh chilies to the garlic, ginger, and onion combination. This initial cooking step is also the place to add a paste, like curry, black bean, or miso, for even more interesting flavors. However, if you do add a paste, hold back on the soy sauce in the basic sauce recipe, so your stir-fry isn’t too salty.  Sauces like oyster, hoisin, fish sauce or black bean sauce can also replace at least some of the soy sauce and be added directly to the basic stir-fry sauce base if you want to use them. 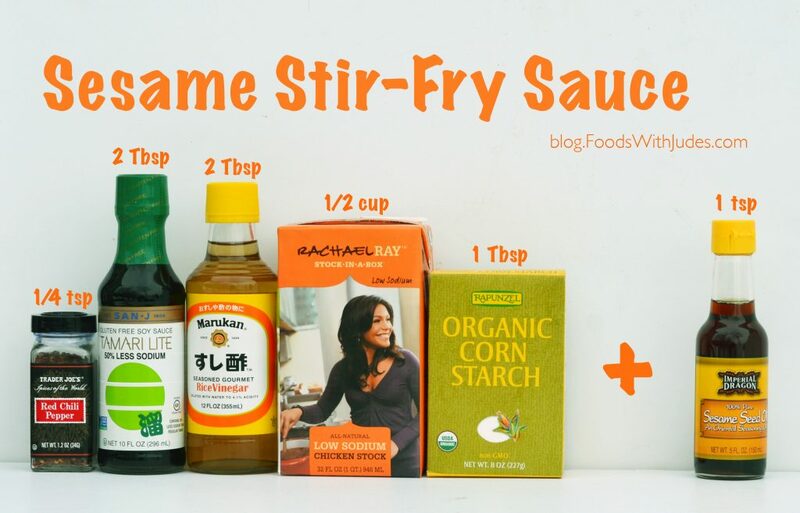 Basic Stir-Fry Sauce: Mix together 2 Tbsp of reduced-sodium soy sauce or tamari with 2 Tbsp rice vinegar, plus 1/2 cup of stock (use no-salt or reduced salt stock). Add 1 Tbsp of corn starch or arrowroot plus 1/4 tsp (or more) of the red pepper flakes. Whisk the ingredients together well, or shake them in a closed container. Sesame Sauce: Add 1 tsp sesame seed oil to the basic sauce. Sweet & Sour Sauce: Add 2 tsp tomato paste (double concentrated) plus 3-4 tsp raw honey (or sugar) to the basic sauce. 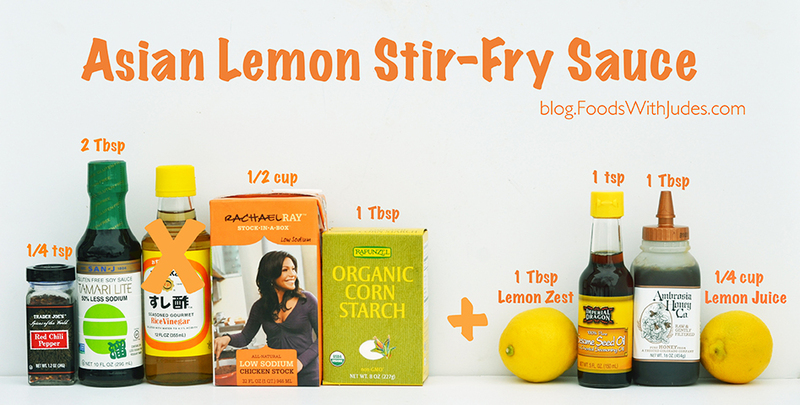 Asian Lemon Sauce: Reserve the zest of one lemon to cook with onions. Replace the rice vinegar with 1/4 cup lemon juice in the basic sauce. Also, add 1 tbsp of raw honey (or sugar) and 1 tsp of sesame seed oil to the basic sauce. 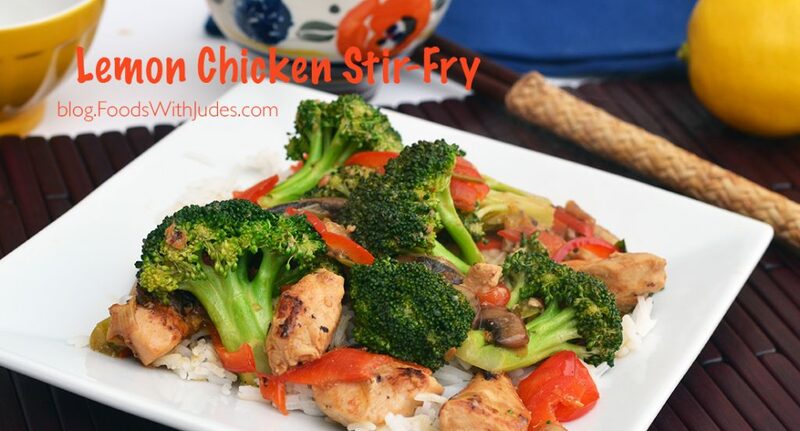 Sauce of your choice = scrumptious stir-fry!! Once your sauce is put together and the vegetables are cut, you are ready to go. Using a wok or large skillet over high heat, add any combination of garlic, ginger, and onions to the hot oil. Stir-fry for about 1 minute. Add the protein (tofu, bean curd, chicken, shrimp etc.) and stir-fry until browned (or until the shrimp is pink) and just cooked through. Remove the protein to a plate and cover with foil. Add the thickest vegetables to the pan first, and stir-fry for a couple of minutes. You may need to add another teaspoon of oil if the vegetables are sticking. Then add the thinner, faster-cooking vegetables to the pan and stir-fry for about 1 minute. Add your sauce and stir-fry until crisp-tender. Add the protein back into the pan, heat through, and serve. Garnish with a few toasted sesame seeds, if you wish. I serve my stir-fry with brown rice. In fact, by using just a tablespoon of healthy oil and the stir-fry leftovers, I prepare “fried” rice the next day. Brown rice holds up better than white rice during the frying, and the leftover stir-fry ingredients give the dish a great flavor—two satisfying meals for the price and time of one! Check out my Bok Choy Fried Rice recipe for an example of this concept. Another tip: If you use chicken in your stir-fry, marinate the chicken in one egg white combined with 1 tsp of sesame oil, 1 Tbsp of cornstarch or arrowroot, and rice wine (enough to cover the chicken). Make sure to drain the marinade off the chicken prior to cooing it for better browning. Chef Tim, Director of Loretta Paganini’s International Culinary Arts & Science Institute, gave me lots of stir-fry advice and told me that the egg white gives the chicken a sheen like you often experience in Chinese restaurants. Thanks, Chef Tim! 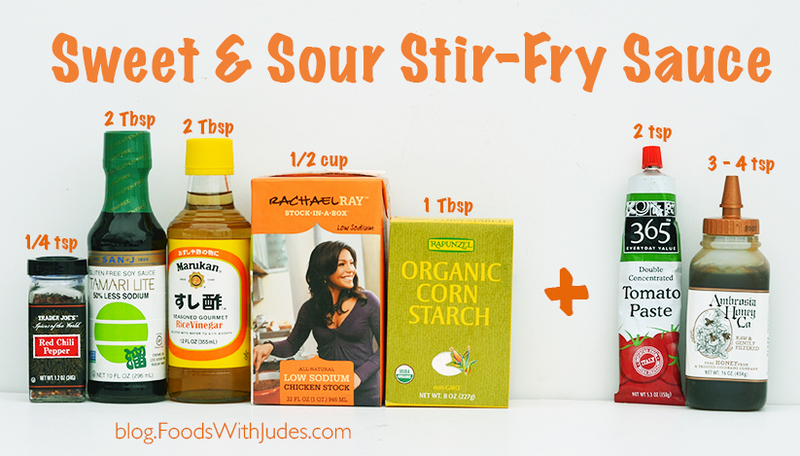 Awesome, finally a simple formula for making healthy stir fry!